Hey guys, it was really cool if we think it from purely literary point of view. What else it can be, when you have Orhan Pamuk, Gulzar, Javed Akhtar, Gurcharan Das at one place to go for and that, too, on a single day. Start with your best and the Jaipur Literature Festival this year started with this pretext as the line-up for other days suggest but I will come to that later on. Last year, I missed it. This year I am missing the India Art Summit while attending it. Yes, to Pamuk first. It was not just about his works with “My Name Is Red” and “Museum of Innocence” in greater focus here but also how a family man of Turkey became a global icon of thematic writing. The important point is Pamuk talked about things in a generalist approach of a legendary writer, suave, direct, yet in-between the lines. He says at one place while answering a question on “Museum of Innocence”, “about what a man can do to a woman when he is terribly in love”. Yes he can change the world, the world that means for him and for his partner; the shape and parameters of the change may be something to be debated, based on the circumstances. A good writing always emerges from cravings of something gone horribly wrong with you and you want to have solace that only a post-mortem of the wrong can give. It may be due to any reason being as simple as not being able to express your love in an effective and glossy way to as complicated as Pamuk’s concern of diminishing language and culture when he sees a rich heritage in some other part of the world. 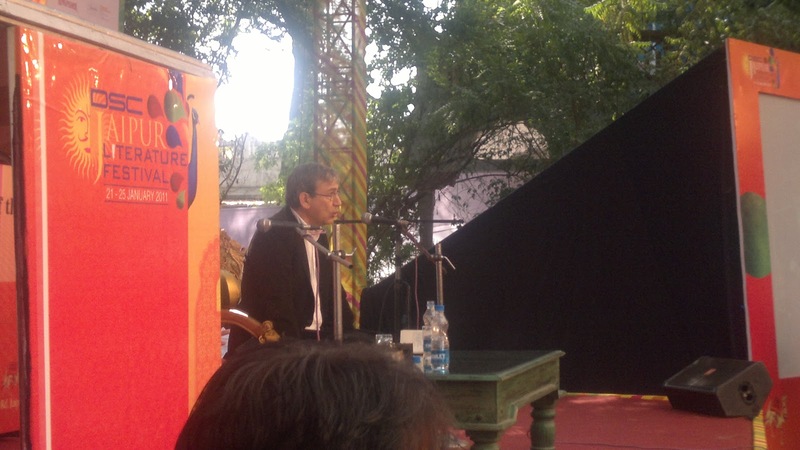 As the session moves, the writer in Pamuk talks more about love, its nuances. He says he believes human heart is basically same everywhere. He talks about manifestation of love and how he goes about it in his works. Love attaches itself to the objects and when we encounter them they bring the past back to us. Isn't it the reason behind the psyche to kill an identity, a relation first, either deliberately or spontaneously before going on to try the other? Idea of co-existence is probably the most poorly understood concept in human relations. And pain has this virtue that it makes a conscious soul even more soulful. One needs to endure the pain to the level of finding extreme bliss in one’s own company. I cannot comment on Pamuk’s biography but when the author talks about enduring and assimilating loneliness and learning to live with the pain of love for a soulful writer, it tells many a things. As almost all literary endeavours, writing too, has its overtures of reflections. Pamuk is there as a fictional figure in his works entertaining and antagonizing his readers. It all depends on our idea of time as it shapes how we think. And time is modified by various proximity factors. Pamuk echoes here when he says we live in two types of times. The sooner we realize what is apt for us better human beings we become. “I talk in terms of images may be because I am a failed painter.” Pamuk explains while answering a question on his style of writing and use of motifs in works like “My Name Is Red”. It again conforms to the craving to prove you through your words imagining and imaging what you so desperately wanted to be. When you are terribly in love and you get an immature and dishonest partner, you may end up doing up terrible things positively or negatively, positively to feel levitated, negatively to feel liberated. So we have another great work on human emotions from Pamuk in the ‘Museum of Innocence’. Pamuk talks about feminism, sexual politics and other related issues in his works especially in case of “Museum of Innocence” but skirts a direct answer to a question thrown on quality of commitment in love in philosophical terms and love in real life. But can a girl ever love anyone else or can she be a true friend of someone other than her own self honestly? It might be bizarre or funny but, yes, this one is a relevant question. Probably some great literary work would try to answer it one day. Overall, it was a session away from the serious hangover of pure literary discourses with few questions by the person entitled to be in-conversation with Pamuk as well as three-four questions by the audience. I am no literary hand but the questions asked were typically of the nature of Jaipur Literature Festival, a serious literary event now so heavily commercialized that it kills the soul of the literary discourse. But to compensate that one can find good things here to talk about like catching your favourite author in person for a one to one talk. Otherwise it was so far so good with some more Pamuk on the way. “I was supported by my father till 31”, Pamuk replies to a question on how he managed life of a writer with no returns and recognition during his initial days when and that, too, in a society like the then Turkey. Yet he points to the fact that aspiring authors have more difficult times in the Western countries while their counterparts in the Eastern part of the world have thankfully a great family support system acting like a cushion. In the Indian context, this statement is certainly debatable. He goes back to his 2003 India visit. He tells us how he arrived on the literary scene and captures it in one sentence when he says his days in Turkey to get published his first novel were the most difficult one. 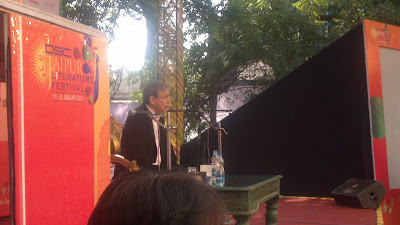 So it was certainly a trademark Orhan Pamuk session all the way, at least for me.